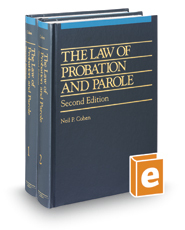 This title provides expert guidance for handling most probation or parole matters. Text cites emerging trends and analyzes relevant federal and state court decisions and statutes. Subjects include probation granting, including coverage of eligibility, limits of discretion, factors used in probation decisions, federal parole law, and supervised release. Probation and parole conditions are discussed, as well as the rescission. Addresses modification of probation and parole, who may seek it, and the authority for ordering it. General principles of revocation are also covered, including the timing of the violation and ex post facto laws.